GMC is best known for their sturdy trucks, vans, SUVs, and other large utility vehicles. While you may not catch James Bond behind the wheel of the latest GMC Sierra 1500, the American car company has had a recognizable presence in a variety of other movies. Here are just a few of the films featuring a GMC. One of the quintessential films of the romance genre, The Notebook pulls on the heartstrings of many, thanks to the chemistry between Ryan Gosling and Rachel McAdams. However, a third character-of-sorts that might not get as much recognition is the 1935 GMC QB. Gosling’s character, Noah, drives the classic truck throughout the film, while Allie (McAdams) can be seen driving a Hudson Commodore. Another romance film with a GMC truck as a co-star is Clint Eastwood’s The Bridges of Madison County, which stars Eastwood, Meryl Streep, and a 1960 GMC 1500. The truck belongs to the National Geographic photographer played by Eastwood, who develops a relationship with an Italian war bride (Streep). Together, they drive around Madison County, Iowa, in his GMC, taking photos of different covered bridges and getting to know each other. The GMC even acts as a symbol of the photographer, with one glimpse of the green truck able to cause an emotional reaction from Streep’s character. What do Aliens vs. Predator and the GMC Terrain have in common? They’re both crossovers! While AVPR is the second installment in the crossover series of the Alien and Predator franchises, the GMC Terrain is a crossover SUV. Unfortunately, the Terrain doesn’t make an appearance in AVPR, but a 2005 GMC Yukon XL does. The Yukon XL belongs to Sheriff Edward Morales in the movie, and he can be seen driving it as he and the rest of Gunnison, Colorado, must face off against the Predators, Aliens, and the Predalien. An independent film that actually features a decent performance from Nicholas Cage, Joe centers on Cage’s character, Joe, who hires a young boy named Gary to help with Joe’s work as a foreman for a tree-poisoning crew. 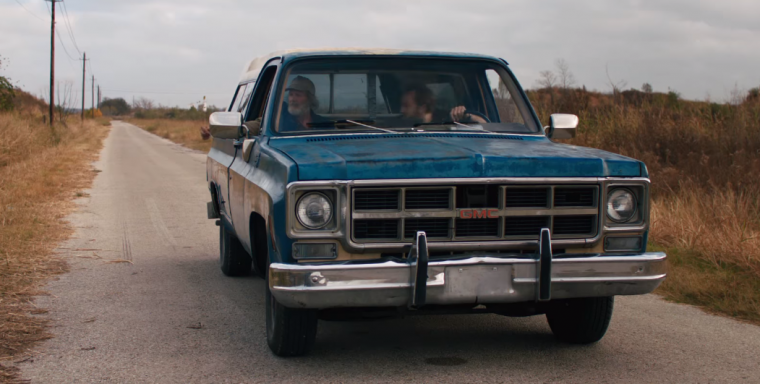 Joe becomes a father figure of sorts to Gary, and there is talk throughout the film about Gary buying Joe’s 1997 GMC C-15 off of him. The truck has a strong presence in the film and acts as a plot point more than once, but you’ll have to watch the movie for yourself to see how. Just be aware: this is certainly not a light, happy, feel-good flick. It’s difficult to talk about cars in movies without mentioning Michael Bay’s Transformers franchise. Whether you’re a fan of the series, or whether you’re sick of the seemingly endless sequels, there’s no denying that there is a large variety of car brands featured throughout the franchise, and that includes a fair share of GMC vehicles. Probably the most notable GMC model in the series is the GMC Topkick C4500, which acts as a disguise to the autobot Ironhide.